This entry was posted on Wednesday, August 8th, 2012 at 12:50 pm	and tagged with childhood, family, fashion, humor, parenthood, school, shoes, summer, supplies, weather and posted in Uncategorized. You can follow any responses to this entry through the RSS 2.0 feed. This was so cute, I felt so nostalgic when I began reading and seeing the picture of the trapper keeper. I loved mine! I loved back to school shopping when I was younger. Your post was very well-written and did what it intended to do- take the reader back to the past and to the time of innocence. thanks so much for the kind words. I really appreciate you taking a minute to read it. I want to go to a land where summer never stops, but you can still carry around Transfomer binders. That’s Australia right? Yes, but I’ve heard you have to watch out for vampires. I think you may have found a product that can unify the world. Who doesn’t love the Trapper Keeper? 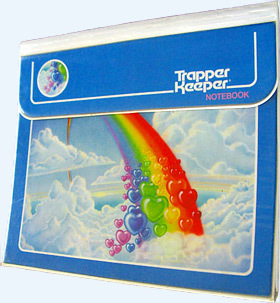 Who doesn’t remember their first Trapper Keeper? Who doesn’t feel better just knowing that another person also treasures their Trapper Keeper memories. I think if Obama shows up at the DNC carrying a Trapper Keeper, it’s all gonna be okay. Oh, and I’m in the middle of revamping my blog – new name and new look – and I’ve created a fave blog roll page that includes your blog link! Not like you need it, Mr. Freshly Pressed Every Time I Take A Piss. You are too sweet Cristy, I am looking forward to seeing your new blog I mean especially if you have dedicated an entire page to me….erm, what was that? Its not a whole page? Kidding, I am honored to be included. Now if I could shake free of the blog apathy and actually write something. I totally feel you on the Trapper Keeper, still waiting for the executive line to come out with a leather embossed Ferrari on it. Thanks for your kind words as always. I am waiting for the business line of trapper keepers myself. Time goes by way too fast, we have to cherish every moment we have and remember that even the times that wear us out will be sorely missed one day. thanks for stopping by. It is crazy how early it starts and the stuff they put on those lists these days. Looking forward to reading your next post. You got it all right. I remember the thrill of anticipation waiting for school to start and the promise of new school clothes and shoes. Even as an adult working in a school — I’m an education assistant — I still go out and buy myself a new outfit and shoes to start my new work year. LOL The more things change, the more they stay the same, I always say. And as for your ‘weak’ argument: I absolutely dread the end of summer. Always have, and now that I’m in my fifties and looking forward to retirement I dread it all that much more. I want summer to go on forever, it’s just that simple. Well I hope you have a good year. I will never forget not being allowed to wear my new school shoes until the first day and wanting to so badly. Thanks for reading. I had that exact Trapper Keeper and I still hold it dear to my heart. I don’t remember why it was such a big deal but it was soooooooo cool. I still love school supplies. That’s awesome. Luckily, this isn’t the one that I had or I could have gotten beat up a lot but it was the best looking picture I found haha. Great post! Thanks taking me back to those carefree days. As a child, I used to love getting school supplies as it was the only thing I didn’t have to beg or throw a tantrum for—I was entitled to it. I used to spend the whole day smelling the new books and writing my name on them, imagining how that year was gonna be my year. I still go window shopping in stationery stores; just love ’em! Thanks for reading! All of that new stuff and the start of a new year can be pretty special. So I’ve always loved getting school supplies. Always, always, always. But this year I didn’t love it so much. I waited too long, Target was super-crowded and out of a lot of stuff, my kids spontaneously lost their ability to read lists as they wandered over to the video game aisle, and I was hungry. Next time I’m hittin it hard in mid-June when the aisles start to fill with erasers that smell like strawberries. Great post as always, Simon. Aw man, erasers that smell like strawberries, I had forgotten about how much scented and scratch and sniff stuff we used to have. I did attend the school supply shopping trip but also succumbed to the electronics section and let the ladies pick out the sparkly folders. Awesome, glad you liked it. Weren’t Trapper Keepers the best? Those things really stuck – I guess they were reallythe precursor to modern-day velcroe which makes them even more genius! 🙂 Another great post. I always look forwrad to your posts because I know I am guaranteed a good laugh. Keep up the great work!!! I truly appreciate such kind words. I have been trying to keep the apathy at bay and maybe I will break out of it and generate some new ideas soon. Always appreciate you stopping by. No worries. That happens to all of us. I am just excited whenever you do post. Maybe you need more water balloon fights? You live in Texas – you can do that all year!!! You totally hit it on the school supplies. It saddens me to send my 3-year-old off to preschool with a brand spankin’ new box of crayola crayons knowing full well that within the week they’ll be in one giant box – paper torn and broken. Blah. Thankfully though, he doesn’t start till the first week of September, so for us up here in NC we’ve got one more month of summer to go! Well at least they are Crayola and not Rose Art (shudders). Thanks so much for reading. Enjoy the last month of summer! The kids here don’t go back until the day after Labour Day (first week of September). They finish in June sometime. It seems a shame to have to go to school in August as it is usually the hottest month of the year and clearly still summer. 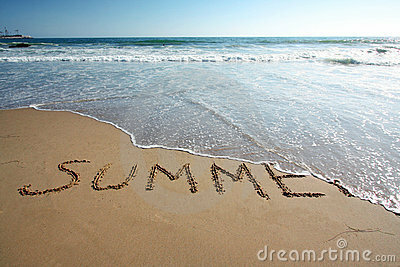 I think that is the best way, It is clearly the middle of summer right now and way too early to start back. Thanks for stopping by Michelle. I’m a last-day-of-summer kind of girl too! Sundays are particularly evil now that I’m growed up. 🙂 But yay for new Trapper Keepers! I can’t believe school is starting already, gosh it seems too early. It does seem early and kudos on being a last day of summer girl. thanks for reading Audrey. You nailed this Simon. My girls are living the sub-par supplies & clothes life as school approaches, but in typically awesome fashion don’t seem to care. I hope your 1st grader’s teacher is as great as our kids’ – FUN times. Sid, you are the one that nailed it. These are fun times and the right teacher is so important. Your kids being awesome is obviously a reflection of their upbringing so you are to be commended. Good stuff, as usual. Love the nostalgia — I remember a Kool Aid book bag I once had. It came with a red plastic lunch box and a little reusable milk bottle. I sent away for it with collected labels, and couldn’t wait to show up at school with it. I actually looked it up on eBay the other day to be sure my memory was correct! I also had a pencil case that looked like a big vinyl pencil that zipped around the eraser to reveal the tube-like container. Pretty cool…. I think I remember a pencil case like that but the dedication to collect the labels and send away for the Kool-Aid backpack is awesome! I can see you and your velcro right now and ohhhh man, I am absolutely reliving my Lisa Frank days with all those bright colors and cuteness. You are really good at taking me back to moments that people sometimes take for granted. I think that’s one reason I like your posts so much. haha, you would have been a Lisa Frank girl. Thanks for always saying the nicest things La La. Wonderful article! Very nostalgic…I particularly remember when my eldest daughter started school. She had her plaid (wool) skirt , new sneakers, and teddy-bear backpack on — and it was at least 85 degrees (in Southern Ontario in September). We’re still in summer mode, but you can feel fall approaching — at least at the mall! But I, too, love the idea of all those new supplies. Walking into a Staples or Office Depot store can be sheer heaven to me. Well enjoy the last bit of summer and good luck with football this season. Your a good mom for feeling bad. Thanks for stopping by. Simon, I loved this. I can remember those first days of going back to school and getting those school supplies — the fresh clean paper, new pencils, all that (you just described it so perfectly). And I was like you; I didn’t have all the “new” stuff either. I had sisters and hand-me-downs. Good luck with your sweet little one — in first grade, that must be bittersweet. Oh and the thing you said about summer: “The last day of summer vacation is like the Sunday night blues times infinity.” PERFECT. YES. It most certainly is and I’d wish I’d written that. It makes me kind of hate you, but in a good kind of way. (and I know you get that last statement). ;). You’re simply the best Brigitte, I appreciate the kind words even more because I have been a bit blocked and apathetic about writing and the blog lately. It means a lot. I’m right there with you. I keep thinking I’m just going to slap a picture of something up with a witty comment, but I don’t have that much witty in me either. That apathy thing is a monster sometimes. So there’s that. You’re welcome and no you are. (the best). :). I just saw your comment after I already posted, so please know I’m not a stalker or anything. But I hope you continue your blog. And you too, Brigitte. I enjoy reading anything both of you write. I’ve been in the same mood. It’s becoming a chore, and I’m wanting to do quickie posts to keep it going. Life gets hectic and you don’t have time to write. And when life slows down, you can’t remember what to write about. Don’t quit!